No matter what you decide for fuel, one thing that is common to them all is allowing the grill to heat up. The best way to start your coals is with a chimney starter. With crumpled newspaper in the bottom and the charcoal on the top, no lighter fluid is needed. Just light the newspaper on fire and time will take care of the coals (about 30 minutes). Be careful loading the barbecue with these hot coals, the handle will be hot. 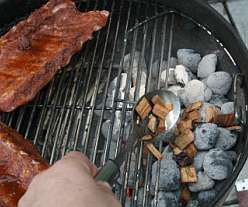 Without a chimney, just mound the coals in the middle of the barbecue, and with the vents wide open on the bottom, squirt some barbecue starter on the charcoal and light to get going. Don't put the lid on, lots of air is needed. A two temperature cooking area is ideal for most circumstances. This will allow you to move the food to the cooler section if it�s cooking too fast, and move the slow cooking things over to the hotter section. 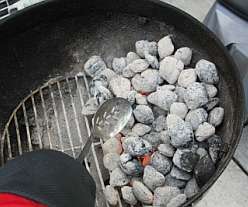 When wanting direct heat, bank the coals to one side of the grill. This will give you a hot area, and the cooler area is around the coals and towards the other side. An important ingredient to a fire is air. The more air the fire gets the hotter it is. Therefore if you want a hotter fire, open the vents below wider to allow more air in; and to cool the fire, close them more. You can completely extinguish the fire by cutting off the air all together. Closing both the top and bottom vents will put out the fire and you'll have charcoal left for the next bbq. Large roasts and whole chicken require an indirect heat. 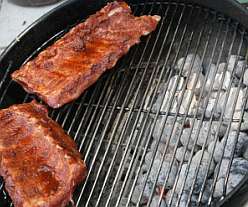 To set your barbeque up for this, remove the grate and set the coals up to either side of the grill. Place a disposable aluminum roasting pan in the middle. This will catch any juices that fall and can be used for gravy if desired. Return the grate to the barbecue and place the roast in the middle, above the drip tray. It�s a good idea to monitor the temperature for something like a roast. 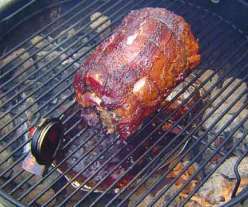 Place an oven thermometer that has been lightly covered with dish soap, at the centre, where the meat is. Starting with a clean grill always helps. Fire up the coals and place the grills over top. When the grills are hot, now is the time to clean them. Use a stiff wire brush to remove any softened leftovers. Next, fold a paper towel into a little square, grasp it with some long handled tongs and dip it into some cooking oil. 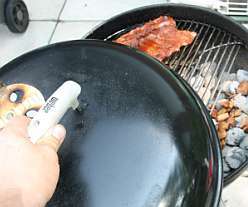 Quickly wipe the grill to clean it and oil it at the same time. Return the cover to the barbecue to let the grills heat up again. Repeat the oiling just before the food goes on if you plan on cooking something that sticks, like fish. 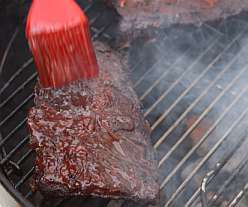 You can reduce flare-ups by letting excess marinades drip off before putting the food on the grill. This is especially true with marinades that use sugar, oil or butter. When flare-ups do happen, move the food to a cooler spot. Having a squirt bottle with water in it is also a good idea to help with flare-ups. 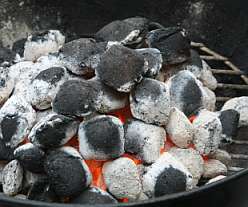 Even with natural charcoal, you may still want more smoky flavour. Soak some wood chips in water for 1 hour before using. These may be hickory, mesquite, apple or any other desired flavour. When the food goes on, throw some of these chips directly on the coals. You�re neighbours will be jealous of the smell! The vents to the lid should always be placed on the opposite side of the wood chips, directly over the food . Always brush the sauces on near the end of cooking. The sugars in the sauce will burn if put on too soon.